a Customised SEAT Ibiza is all I want for Christmas! One very lucky music-lover’s Christmas was made extra special thanks to SEAT. SEAT teamed up with award-winning music show On Track with SEAT to give away a completely unique customised 2012 SEAT Ibiza, filled with thousands of pounds of top-of-the-range audio equipment. The lucky winner was Liverpudlian electrician Daniel Davies, who won the car after correctly answering a question about the Kaiser Chiefs. The win is particularly sweet for Daniel, as he was without a car for a year after his broke down. With tens of thousands entering the competition for SEAT’s unique supermini, he never expected to win, but described himself as “absolutely made up” to have triumphed over such long odds. Daniel’s SEAT Ibiza is a true one-off. Not only does it come packed with a mouth-watering audio system, it’s filled with luxury touches. The SEAT team in charge of designing the unique supermini took the SEAT Ibiza SC 1.4 85 PS Sportrider and pimped it out in a way that would make the famous MTV show proud. They added luxury leather seats and embossed them with the On Track with SEAT logo, so there will be no mistaking this one-of-a-kind car for imposters. Then they went wild on the Customised SEAT Ibiza multimedia system, putting in everything a music-lover could want. SEAT engineers fitted a feature-packed Kenwood multimedia suite including their DNX5260BT DVD/USB Receiver with a 6.1 inch colour touch screen on the dashboard, allowing Daniel to access his entire iPod music library instantly. Top-class sound quality is ensured in Daniel’s SEAT Ibiza with a selection of the best surround sound Kenwood has to offer. Two powerful amplifiers pump out a massive 2,800 watts, while this SEAT Ibiza’s boot and front doors have been customised to house top-quality speakers and a sub-woofer. 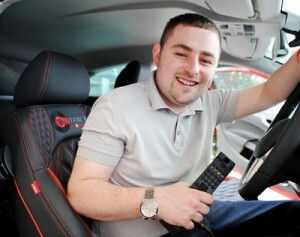 As the finishing touch, SEAT fitted a 22 inch HD TV in the boot. Naturally Daniel’s uniquely customised SEAT Ibiza comes with a more than generous selection of the Ibiza’s standard features. These include 17 inch alloys, climate control, rear parking sensors, automatic lights and windscreen wipers. It comes with Bluetooth connectivity, enabling Daniel to make quick, safe and legal phone calls when he’s on the road. He will also be able to enjoy the impressive performance of the customised SEAT Ibiza, going from 0 to 62mph in a zesty 11.8 seconds and hitting a top speed of 110 mph. Anyone wanting to get their hands on their very own Customised SEAT Ibiza can pick up the Ibiza model Daniel’s car is based on for just £12,625. If you’re interested in buying or leasing a new vehicle contact our sales team. Alternatively, visit our website where you will find new and used SEAT’s available for sale or on finance. Would you like something like this for Christmas? 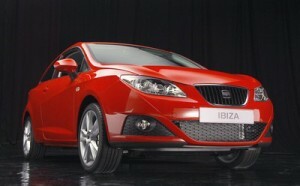 a Customised SEAT Ibiza?